Extremely light and inflatable. The lightest dome cinema makes a virtual dive into the sea-world possible. In order to dive into the sea, the visitors have to first of all look up: The ceiling is arched, and from up there sparse daylight makes its way down through the deep sea, which surrounds the visitors. Fish and jellyfish glide by, and suddenly you’re surrounded by the Ocean Experience. The fact that you can stay dry during this thrilling dive is attributable to modern technology: You can dive deep via 360 degree film-projection, in which there is something to be seen on all sides – just like in a planetarium dome. This dome cinema belongs to the Helmholtz-Zentrum Geesthacht, Centre for Materials and Coastal Research. It is inflatable like a jumping castle, therefore extremely light for a cinema. For the set-up, only 100 sq m of ground space is necessary, one day of work, and a hydrant, since it is held down to the ground with eight tonnes of ballast water, so that it won’t be blown away by the wind. A special reflective material is attached to the inner wall – and the “cinema-in-the-round” is finished, able to accommodate up to 35 visitors. The inflatable construction is for the most part on the road, in order to provide viewers everywhere in Germany a look into the scientists’ work. 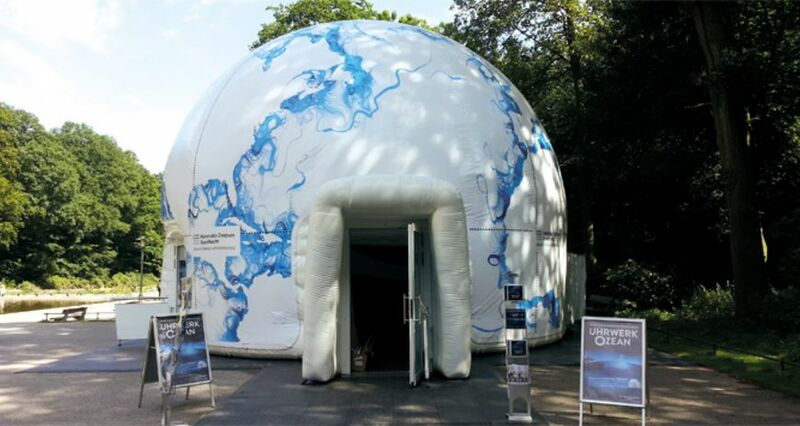 Currently, a film is being shown in the dome tent about the so-called “mini sea-vortices”. Until recently these were still unknown; while, in the meantime research scientists have found that they have a considerable impact on, for example, fish stocks, the transport of energy in the oceans, the large vortexes in the world’s oceans, and the climate. But other films are also conceivable for the inflatable dome cinema: Movie goers in the future will be able to take a virtual look at the inside of materials, and even step into molecules.